Transform a life through sponsorship. Would you like to help us transform the life of a disabled person by sponsoring one of our amazing dogs? Whether you want to sign up to our popular My Amazing Puppy scheme or give the Gift of Independence, we have sponsorship packages suitable for everyone. The My Amazing Puppy scheme allows you to sponsor one of our puppies for as little as £1 per week. 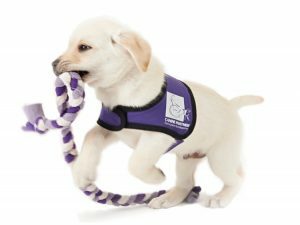 You will receive a puppy pack including a soft puppy toy, certificate and photo of your chosen pup as well as regular pupdates to find out how your puppy is progressing with their training to become a life-changing assistance dog. Our Gift of Independence packages are a great way of playing a pivotal role in the creation of a life transforming partnership between a person with disabilities and one of our amazing dogs. There are a number of packages available for different budgets, including those that mean you can name the puppy, support a dog in their specialist training or create a life changing partnership in its entirety. Give the Gift of Independence from puppy to partnership and onward supporting an amazing canine partner throughout his or hers working life (to around 12 years of age). So whether you are a fundraiser that is looking to raise around £800, or a business with ambitions of reaching four (or more!) figures and making a real difference, visit our Gift of Independence page to find out more and sign up today. Are you looking for a unique present for a friend or family member? Then look no further than Canine Partners’ Virtual Gifts. From just £10, you can purchase one of our assistance dogs in training a gift on behalf of the recipient. With each Virtual Gift you receive a card from one of our amazing dogs to personalise and send on. Help us to train more amazing dogs by purchasing a Virtual Gift today. Find out more about Virtual Gifts.